Well. I guess I can finally call Beijing home! Wherever we have lived we have had a favorite restaurant where they always have a table for us and we never order off the menu, the chef just brings us food. In Toronto it was Opus, in London, Pied a Terre, and in Vancouver, Hawksworths. 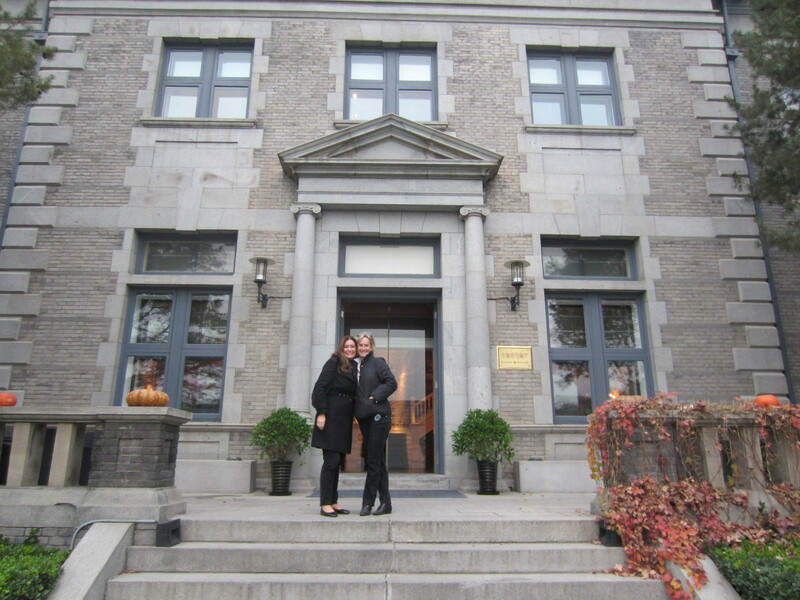 As of yesterday, we have added Maison Boulud in Beijing. Brian Reimer, the chef, greeted us with a kiss, said, “welcome home” (it was our third visit this week) and made me my favorite cocktail. We only had 1-½ hours because we were going the theatre afterwards. He suggested we skip menus and leave food up to him. It was heaven! 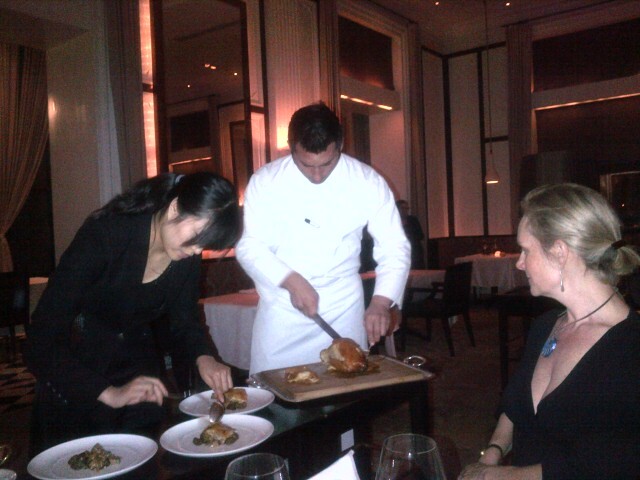 Nothing was on the menu and it was all divine… Squash soup with blueberry puree, lobster salad with truffles, tiny potatoes and quail eggs with caviar, risotto with white truffles and finally a perfect roast chicken (so simple and yet so hard to do really well). Sadly, we did not have time for dessert, but he brought us a bowl of hot madeleines just so we could have a tiny something sweet. We dashed to our car and drove like mad to the National Centre for the Performing Arts. This is one of Beijing’s landmark buildings. We “locals” call it the Egg. The building is a titanium and glass dome surrounded by a moat and looks like a giant egg lying in its side in the water. You enter the building through a long glass ceilinged hallway, which runs under the moat. Everything about the space is huge and dramatic. It has also been very controversial. It was wildly expensive and way over budget. The final cost is estimated at 3.2 billion CNY (more than $500 million). Maintenance of the building is reportedly 1 billion CNY per year ($158 million). There is a lot of glass to polish. It has 5452 seats in three theatres. We were lucky enough to get tickets to see Kevin Spacey as Richard the third. Directed by Sam Mendes, the production had been a huge hit in London, and now we know why. It was amazing. He is one of the most compelling actors I have ever seen. I literally could not take my eyes off him when he was on stage and felt deflated whenever he was off. The play was long, 3 ½ hours, yet time just flew by. The sets were incredible, modern and stark yet surprisingly effective. The whole audience jumped to their feet when the curtain came down, giving Spacey an enthusiastic standing ovation! A great night. The play is traveling around the world and I cannot recommend it highly enough if you get the chance to see it! A little chowder update… He seems to have developed a taste for rooster/chicken and pulls madly at the leash whenever he sees one. And there seem to be a lot around these days. I have a suspicion that people see us coming and hurl them in to our path, hoping for a chance for some easy money. You know you over paid when… Chowder is so big and strong. I am a little worried I am developing Popeye forearms trying to hold onto him!